Reflexology and depression by Adriana Pop at Chelsea Natural Health. 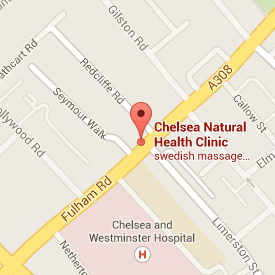 Reflexology and depression by Adriana Pop at Chelsea Natural Health Clinic, Fulham Road, SW10. The exact cause is not known. Anyone can become depressed. Some people are more prone to it, and it can develop for no apparent reason Reflexology helps clients to deal with the symptoms of depression such as insomnia/ disturbed sleep, anxiety, low vitality and fatigue etc. When people are feeling stressed or depressed, they often sleep poorly. Reflexology can help soothe a troubled mind and body and induce a sense of calm and relaxation, generally helping people to sleep better. Reflexology is very helpful for depression sufferer as it works emotionally and mentally as well as physically. To alleviate depression, a reflexologist will concentrate on reflexes of endocrine system including all the hormonal glands which are related to emotional stability and mental health working especially on the reflex of pituitary gland ( the spot in the middle of big toe or thumb) , thymus, pineal, thyroid and parathyroid. Reflexology for depression will also focus on associated reflex points as are the reflexes for solar plexus and diaphragm that help clients helps clients go into deep relaxation and to breathe deeply, also the reflexes associated with heart, chest, lungs. Gentle pressure to the adrenal reflex point is also very helpful for body response to stress. I also focus on the reflexes of brain and spine (central nervous system ) to calm the whole body system and to release the emotional or physical tension. Reflexology can also help the release of endorphins within the body. Endorphins are the feel good™ chemical that we naturally produce and are known for relieving stress (which can have a big impact on depression). In order to feel a maximum effect a course of treatments are recommended. Reflexology for runners by Adriana Pop at CHelsea Natural Health. Reflexology is frequently being utilized as a tool for pain management, including for the customary aches and pains common to the sportsman and athlete. Athletic individuals are also seeking reflexology to speed recovery after injuries and surgeries. It is recommended for: runners/atheletes, walkers, golfers, people with tired feet, heel pain, plantars, flat feet, toe problems, and corns/callous. It is also beneficial for dry skin, sweaty feet, cold feet, aching feet, foot odor, poor circulation, and other feet problem. reduce inflammation by improving circulation. When a Reflexologist works on someone’s feet the practitioner is not treating for a specific condition, such as foot pain. The concept of Reflexology is that the entire body is reflected in the feet. By working the whole foot the practitioner is encouraging the body’s natural healing abilities to address imbalances throughout the entire body. Some foot injuries may require the reflexologist to switch to the reflex maps found on the hands or the ears until the foot has improved and can be worked on again. In addition to muscle and soft tissue injuries, more serious injuries relating to the spine and brain can occur in contact sports. Anecdotally, reflexology may be a helpful tool to aid in the recovery from a spinal cord or brain injury. Maternity reflexology is specialised reflexology used to nurture the women and her baby on a physical, emotional and spiritual level pre-conceptually, thought pregnancy, the birth itself and during postnatal period. The association of Reflexologists gather feedback from their members and indicates that over 50% of clients seeking reflexology in connection with conception find themselves pregnant within 6 month. Book your treatment with Adriana on Saturdays from 11am to 5pm. Hay fever is a very common condition which affects 20% of the population, typically between March and August. The symptoms are caused by an allergic reaction to pollen and are very similar to a cold including runny nose, headaches, watery itchy eyes and sneezing attacks. When the pollen enters the body of a hay fever sufferer the immune system overreacts by producing histamine that triggers the symptoms of an allergic reaction. Reflexology offers a very effective alternative to antihistamines or eye drops without the drowsy side effects. Reflexology increases blood flow and improves the circulation of oxygen and nutrients around the body. By applying pressure to the toes and fingers, which are linked directly to the head, sinuses and eyes, reflexology helps relieve the symptoms of hay fever. The adrenal reflex is also stimulated which reduces inflammation, helping you to breath more easily. Over the season, hay fever sufferers also have a build up of toxins in the body and weakened immunity. Reflexology applied to specific areas on the sole and heel of the foot encourages toxin release and gives a much needed boost to the immune system.